Even in an age of ubiquity, mobile ownership is still on the rise in Europe. Smartphone ownership among older European travelers grew at a fast clip from 2014-2016. Rising ownership is good news for travel marketers – even more consumers can plan for travel anytime, anywhere. Mobile travel planning is getting even easier for consumers. 42% of European travelers agree they can find the same information on flights and hotels online with a smartphone compared to a desktop or laptop. One third of travelers agree they'd be very comfortable researching and booking a vacation online using only a smartphone. Mostly, travelers like apps that are easy to use. 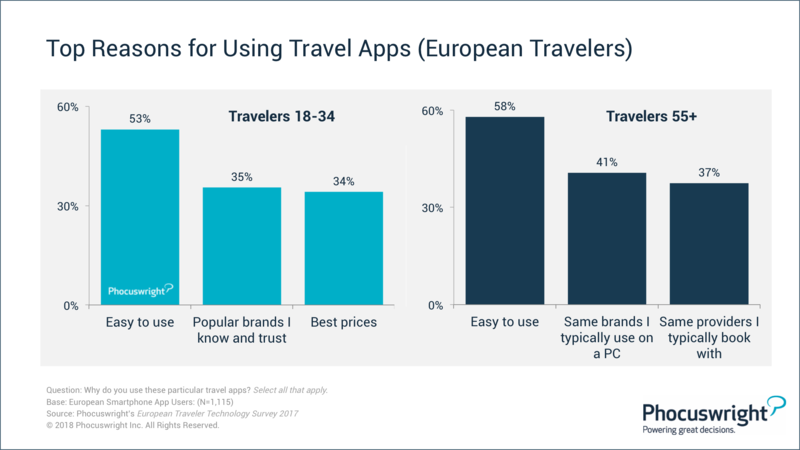 However, young travelers also look for popular travel apps and best prices, while older travelers remain loyal to their favorite brands through brand websites and apps. The top travel apps? OTAs, followed by airline and hotel apps. They're not only sources best used for researching and comparing multiple options prior to booking, but OTAs are typically easy to use and provide a seamless UX. But don't count out mobile web. Smartphone travel searches are up to three times as likely to be made through mobile websites than travel apps. Travel brands can't afford to overlook the reach of the mobile web. You'll find plenty of insights from Europe's travel players covering technology, OTA, hotel, air, investment and more. Start networking via the mobile app! Ticket-holders are able to start networking in the Phocuswright Europe mobile app. Get your ticket now to start networking as soon as possible.